In Maine the first day of school is usually the day after Labor Day. On September 3rd, 2013 I started the year with some very specific goals. I was able to choose some of my goals, and others were chosen for me as part of my school district’s goals. Lucky enough for me they align quite nicely. One of my personal goals for the year involves purposefully planning to apply brain compatible learning principles to all facets of my teaching. Using class time efficiently for increased student learning and achievement being the end result. In an attempt to get organized for this, this summer I put a lot of time in going through my own resources, reviewing past learning, and organizing my thinking around the subject. This work will serve as a guide as I plan lessons throughout the year. Hopefully it will be of interest to other physical educators too. As I thought about planning the first few weeks of school I knew I needed to begin with a focus on expectations, signals, routines, and community building. Over the years I’ve learned that by putting time and energy in up front addressing organization and expectations, as the year progresses students actually end up with more time working toward learning targets specific to the content of physical education with no need to backtrack and re-teach. And with very few discipline issues. As it happens, our school district is relying heavily on Robert J. Marzano and John L. Brown’s book and handbook The Art & Science of Teaching to guide our professional development and instructional assessment. We will begin by focusing on Design Question #1 from this resource, which addresses establishing and communicating learning goals, tracking student progress, and celebrating success. At the same time, our school is moving to a standards based report card and we will be doing a lot of work together as a staff as we make this transition. So with all this swimming around in my head, I worked out how I would weave my own beginning of the year organizational activities with design question #1, working with NASPE’s 5 Standards, while at the same time capitalizing on getting results from teaching the way the brain learn best by applying brain compatible learning principles. I decided to begin the year by using episodic and nonverbal memory systems and strategies to get kids focused on the standards and learning targets they would be “aiming at” throughout the year. When teachers plan to use multiple memory systems to teach each lesson they are more likely to help kids connect more synapses leading to greater strength of memory and improved recall. Episodic memory is the type of memory that is tied to location. The brain remembers things (what) with a time/place stamp (where). And those locations can be used to cue vocabulary, procedures or content. In other words, memory can be prompted by location. Episodic memory is one of the pathways we can use to help kids remember what it is we’re teaching. It works even better when there is a strong emotional connection. Think about it. So much of our memory is embedded in location. Nonverbal memory encompasses our ability to remember and re-create non-verbal/visual experiences and images. Essentially, choosing visual images to connect and represent the “what” creates another pathway to retrieve content. The brain will remember pictures before words, and those pictures will help them retrieve the words. Having played with using these strategies a bit in previous years with health related fitness concepts I knew the results it would yield if done well. I knew that just gathering kids in a specific location would help them recall whatever (information, concept, vocabulary word) I had chosen to tie it to. After making a commitment to my goals, I started thinking about the locations I had to work with (the where), along with how to organize the learning targets/standards (the what), and what images I would choose. I knew I wanted a good visual to use when talking with kids about learning targets and goals and that I would want to attach them to each standard and location so that when kids were cued to gather in that area their brains would already begin searching for an existing framework to make connections to. I chose the symbols seen here and created posters for each location. I liked that one represents “on your way” to the target and the other creates a clear image of reaching it. As part of those first few organizational classes I asked students to think about what the images made them think of. Our discussions naturally lead to the learning targets in physical education and the categories (standards) that they fall under. I teach in a large gymnasium with plenty of room outside of the boundary lines. However, wall space for hanging things up is limited because of the wall material. I have two pretty good-sized bulletin boards available and other option I have for hanging materials are the metal I-beams that serve as support structures from floor to ceiling on all sides. A while back I purchased a set of plastic covered magnets so I could make use of the I-beams. After choosing images to use as memory tools that would connect with each standard I made and laminated the posters and chose some other supporting materials to go in each location. Having separate locations would be the key to using episodic memory strategies. I should note here that I teach K-8 which was a consideration as I designed the posters. I really wanted to be able to use them with all classes. I decided to use one bulletin board for NAPSE Standard #4 and the character qualities our whole school has chosen to focus on and hold students accountable for. Connecting the character qualities to achieving positive personal and social interactions is a school-wide goal so this fit together very nicely. I also chose to put my “Using Class Time Efficiently” poster on this board, as it is one of the skills I focus on during the first lessons and am able to refer back to it for reflection.The character traits seen come from KIPP Charter Schools. Our principal contacted KIPP and received permission to use their character assessment scale. We’re trying it as a whole school for the first time this year and so far it’s working very well. 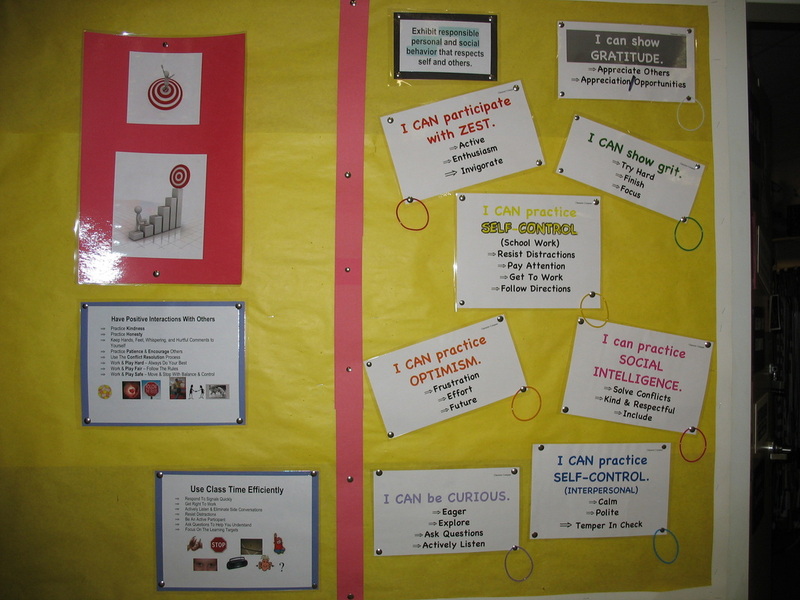 The second bulletin board became home for NASPE Standards #3 and #5. We use the Fitnessgram so I posted the healthy fitness zone posters here as well. 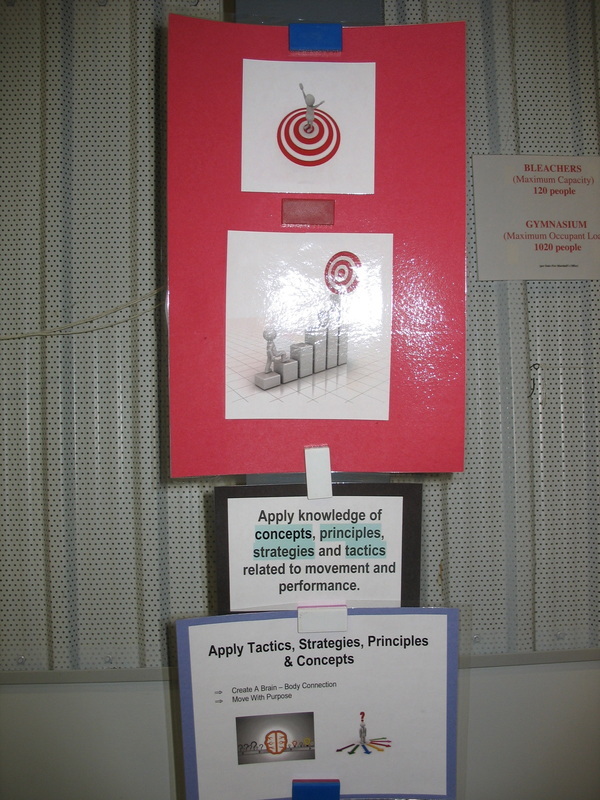 Material for NASPE Standard #1 is posted on an I-beam in one corner of the room. 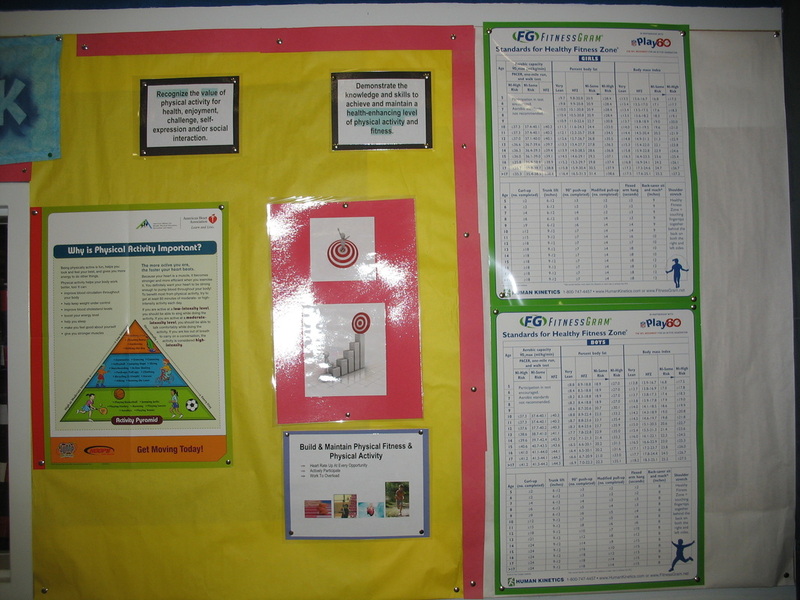 I decided to supplement this area with a poster from the book The Physical Education Assessment Toolkit. An I-beam in another corner is dedicated to NASPE Standard #2. Two posters pictured here from The Physical Education Assessment Toolkit work well with Standard #2. During the first few lessons of the year we did a lot of moving as well as a lot of organizing. I designed physical activities that would help kids learn the vocabulary and signals. They had opportunities to practice procedures and expectations designed as class and group challenges. 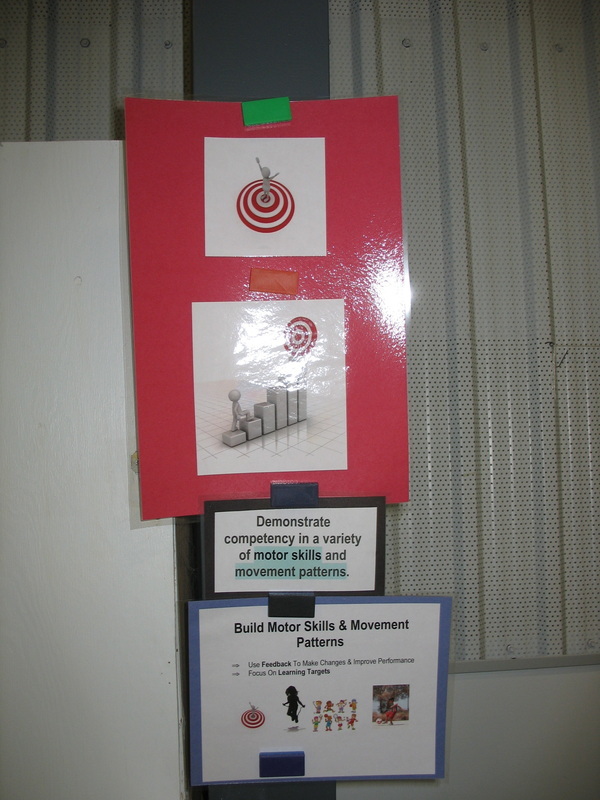 And by purposefully decorating with learning targets (based on the standards) and choosing visuals to connect them, kids got their brains focused and organized for learning and reflecting on their learning targets in physical education. They have developed a “learning target” vocabulary and I have a tool I will be able to use all year long. Each time I gather students to think, talk, instruct, or reflect on/about personal and social interactions it will be in the same specific location. This will cue the vocabulary and the work we have done before, connecting more synapses and creating stronger memory. The same will be true when the target is on motor skills and movement patterns, applying concepts, principles, strategies, and tactics, as well as focusing on physical fitness and physical activity. So far this set-up is working very well. I have used it as part of every lesson and kids are able to identify the learning target we will be focusing on when I launch my “circle-up” beanbag to location near one of the target signs.